Hi again!!! I've been trying to post this card for several days now and finally have been able to do it! I've been holding back on updating my Mac because the latest update no longer uses iPhoto. And I have been using it all these years to edit my photos. Anyways, I broke down and updated my computer last week and then I was having issues getting my photos so I could post on blogger. Ugh! It worked today so now I can do some posts. 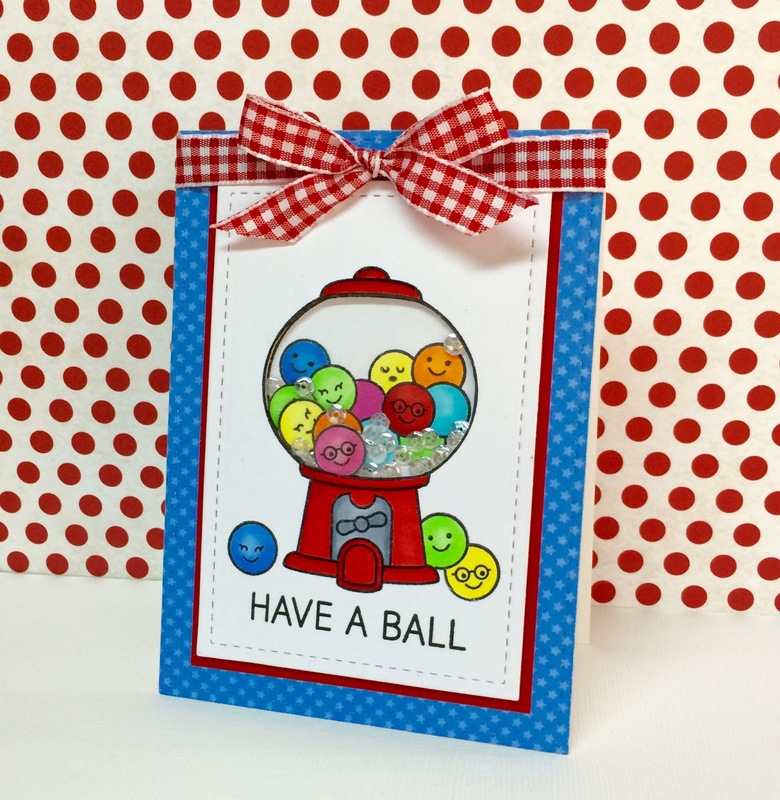 Here is a shaker card that I made using Lawn Fawn's "sweet smiles" stamp set. I didn't even get to use the matching dies but hopefully will make another card to use the dies. This card was a 2 step process. I stamped the gumball machine twice so that I could make the shaker card. One for the inside of the gumball machine and the other for the card itself. I also cut out a bunch of gumballs to use for the shaker part. I remember having one of these when I was growing up. And after you ate the gumballs, you use the machine as a piggy bank. Thanks for coming back to read my posts! Hope you're having a great weekend!!! Oh Boy! I really love that card! I also have fond memories of owning a refillable gumball machine. Your card hit the 'sweet' spot...so cute! Thank you for giving me another LF set to purchase....LOL!